This project examines the riot that exploded in Harlem in 1935, the first example of a new pattern of racial violence that recurred throughout the twentieth century, one centered not on interracial attacks but directed at property and the police, and contained in black districts. Building on our award-winning Digital Harlem website, we map and reconstruct the neighborhood, and develop an innovative spatial analysis, that provides an interpretive key to understanding such violence. Locating the riot in everyday life offers a unique view of a year of economic upheaval, and an opportunity to access what changed in the 1930s, and to what extent Harlem became a slum and ghetto. As was so often the case in Harlem, the police did not help matters. The more the increasingly angry crowd demanded to learn what had happened to the boy, the more the police insisted that that was none of their business and then tried to shove the milling bystanders outside. 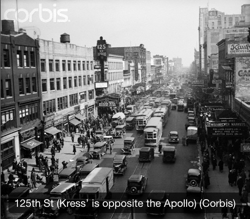 After Kress’s was closed, with some difficulty, at 5.30pm, Harlem blacks continued to congregate on 125th Street. A rock was hurled through the window of Kress’s. Whenever someone tried to address the crowd on the street the police hauled him off his lamppost and arrested him, further antagonizing all and sundry. In a pattern that would repeat itself for most of the night, police harassment led to the crowd dispersing only to reassemble further down the street. Several thousand blacks were now involved and, as the Mayor’s Commission investigating the riot concluded, “From 125th street the crowds spread to Seventh Avenue and Lenox Avenue and the smashing of windows and looting of shops gathered momentum as the evening and night came on.” By the end of the night 697 plate glass windows in some 300 business establishments were shattered at a cost to insurance companies of $147, 315, the police had detained 121 people, and 57 civilians and 7 police had been injured. And most tragically, Lloyd Hobbs, a black schoolboy on his way home from the cinema, had been shot and killed by the police. The following evening, according to a New York Times reporter, “thousands of curious white visitors thronged Harlem’s sidewalks.” No longer did tourists come uptown solely for the nightlife, to listen to jazz or to gaze at the lithe bodies of Lindy Hoppers at the Savoy. Most of the “white visitors” wanted to see for themselves the evidence of what had happened the previous night, to experience city streets that the Times described as “alive with resentful Negroes,” watching everything from front stoops and apartment windows. 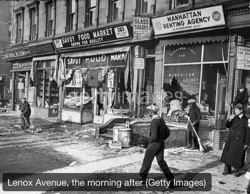 The 1935 riot was indeed a watershed in the history of Harlem. 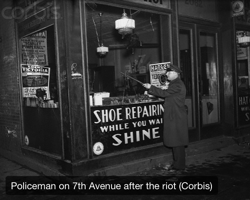 2019: “Law & (Dis)Order in the 1935 Harlem Riot,” Center for Law, Society, and Culture, Indiana University Maurer School of Law, February 28 (Stephen Robertson). 2017: “Law & (Dis)order in Harlem: A Spatial Legal History of the 1935 Riot,” Columbia University Law School Digital History Workshop, New York City, November 1 (Stephen Robertson). 2016: “Mapping the 1935 Harlem Riot: Visualization and Narrative after the Geospatial Turn,” McMaster University, Hamilton, October 26 (Stephen Robertson). 2016: “Toward a Spatial Narrative of the 1935 Harlem Riot: Mapping and Storytelling after the Geospatial Turn,” New Approaches, Opportunities and Epistemological Implications of Mapping History Digitally: An International Workshop and Conference, German Historical Institute, October 20(Stephen Robertson). 2016: “Mapping a Riot: Harlem, 1935,” Working Group on Interpreting the History of Race Riots and Racialized Mass Violence in the Context of “Black Lives Matter,” National Council on Public History Conference, Baltimore, March 19 (Stephen Robertson).